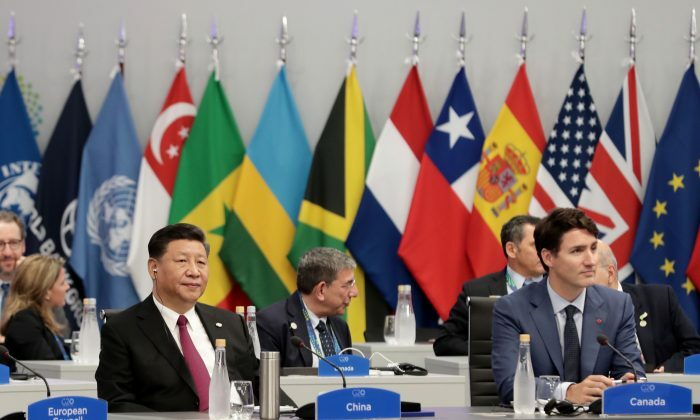 Canada stands to benefit from trade-related outcomes at the G-20 as the United States and China work together and leaders agree international trade reforms are needed. The spotlight in Buenos Aires, Argentina, was firmly on the Dec. 1 meeting between U.S. President Donald Trump and Chinese President Xi Jinping. The leaders of the world’s two largest economies eased trade tensions and set a 3-month timeframe to work out the thorny issues that the United States is accusing China of, such as intellectual property theft, forced transfer of technologies, cyber crime, and less-than-open markets. This is good news for Canada. “Canada’s kind of free-riding on the U.S. doing this, because we haven’t got the kind of influence the U.S. would have,” said Dane Rowlands, director of the Norman Paterson School of International Affairs at Carleton University, in an interview. “I think overall they’ll be pleased by the American capacity in the meeting to drag the Chinese government closer to what would be more expected of a participant at the WTO [World Trade Organization],” Rowlands added. Reports said Trump and Xi had an amicable meeting, but three tough months of negotiations lie ahead. And this is not to be interpreted as the United States weakening its stance on China. In his meeting with Xi, Trump was accompanied by National Security Adviser John Bolton and National Trade Council Director Peter Navarro. “This is a message to the Chinese side that the hawks continue to control the narrative, and there will be no softening or negotiating away by the [Trump] administration on its key tenets,” according to a note from TD Securities. In what appeared to be a nod to Trump’s tough trade rhetoric, the G-20 Leaders’ Declaration acknowledged that global trading reforms are needed at the WTO, but that multilateral trading has made a valuable contribution to global growth, innovation, productivity, job creation, and development. “The system is currently falling short of its objectives and there is room for improvement. We therefore support the necessary reform of the WTO to improve its functioning,” according to the declaration. While there is a sense that China has “broken the spirit of having joined the WTO,” Rowlands said that a general statement is helpful in obtaining a Chinese acknowledgment. “The Chinese are realists in this. I think they understand that they have to be seen as doing something, and I think it’s a good thing that they’ve been called to task here,” he said. The declaration also endorsed preventing corruption and ensuring integrity in state-owned enterprises (SOEs). China’s SOEs have been heavily criticized for anti-competitive behaviour and a lack of transparency. They have also been accused of gathering foreign intelligence for the ruling communist regime. At the start of the G-20, the leaders of the United States, Canada, and Mexico signed the United States-Mexico-Canada-Agreement (USMCA)—the replacement for NAFTA. The USMCA still needs to be ratified by lawmakers in the three countries. However, U.S. tariffs on Canadian steel and aluminum continue to be a point of contention for Canada. Canadian Prime Minister Justin Trudeau took the opportunity to address the tariffs with Trump. “It’s all the more reason why we need to keep working to remove the tariffs on steel and aluminum between our countries. … With hard work, goodwill, and determination, I am confident we will get there. Our shared interests, prosperity, and security demand it,” he said at a news conference. Rowlands said it’s not clear what the Trump administration wants in return for getting rid of the ongoing U.S. tariffs on Canadian steel and aluminum, but that it is likely not simply a quid pro quo. “I think what they’ll say is we’ll lift it in our own good time on the basis of what we judge to be correct to the U.S.,” Rowlands said. He doesn’t think the Democrat-dominated U.S. Congress will put up much of a fight in ratifying the USMCA, as the Democrats weren’t unhappy as Trump was with NAFTA in the first place, and the new trade deal is a better one for the American worker. “I just don’t see this as a hill the Democrats are going to die on,” he said.